Thousands of Japanese rallied against the permanent basing of a nuclear-powered U.S. warship near Tokyo, saying a recent onboard fire made it unsafe. About 13,000 protesters gathered at a park near the port of Yokosuka, just south of the capital, where the USS George Washington aircraft carrier will be based, media reports and organizers said. The George Washington — relieving the soon-to-be decommissioned USS Kitty Hawk — will be the first U.S. Navy nuclear-powered vessel to station permanently in Japan. The ship's arrival was originally set for August under a Japan-U.S. security deal, but was delayed because of a fire aboard the vessel in May. The George Washington's deployment had already triggered protests, and the fire escalated concerns many Japanese have about nuclear power. Some 250 residents have filed a lawsuit seeking to block the aircraft carrier from basing in Japan. People in Japan, the only country to suffer from atomic bombings, tend to be sensitive about the military use of nuclear technology. The U.S. atomic bombings of Hiroshima and Nagasaki in August 1945 killed at least 200,000. The U.S. Navy has said the George Washington's fire, which left one sailor with minor burns and 23 others with heat stress, never threatened the safety of the ship's nuclear reactor. However, some of the protesters questioned the safety of the vessel Sunday. "The U.S. military has not fully disclosed the cause (of the fire)," said Masahiko Goto, a lawyer representing local residents, Kyodo News agency reported. "Japan should not allow a deployment when serious safety concerns remain," Goto said. 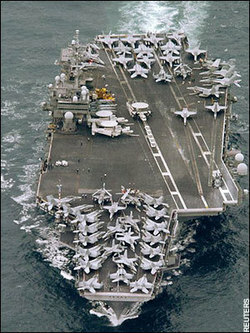 The Kitty Hawk, which was commissioned in 1961, has been home-ported in Japan since 1998 as the only forward-deployed carrier in the U.S. Navy. It is the Navy's last conventionally powered aircraft carrier.